Ashcom Technologies is dedicated to customer satisfaction. They were established in 1985 and have decades of experience in asset management solutions. Their company mission is to provide computerized maintenance management systems to their clients that will create success and sustainability. They have over 3,000 customers worldwide, whom they treat as partners. Ashcom Technologies believes that offering a quality product with superior training and customer support is the best way to ensure profitability for both themselves and their clients. Ashcom Technologies MaintiMizer Suite is a superior computerized maintenance management system which is internet-enabled and easy to use. This asset management solution is a low-cost, high-functioning option that allows businesses to stay organized and streamline tasks. MaintiMizer allows technicians to access data specific to each piece of equipment on the spot and in real-time. They can verify settings, repairs, history, budgetary restrictions- all the information they need to do their job. Manage work orders, schedule tasks and control assets with one system. Available with online, mobile and blackbox options, this system is customizable to suit individual business needs. 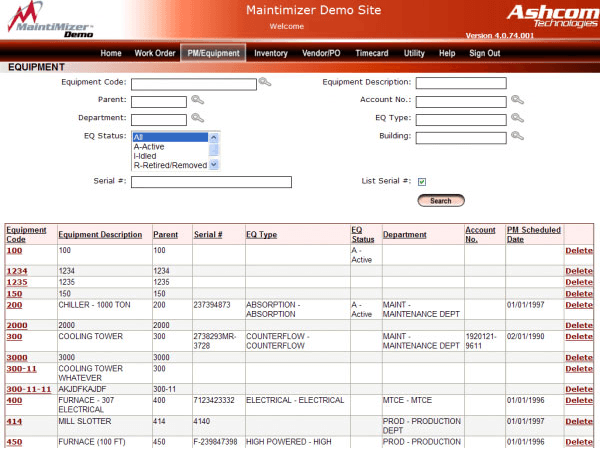 Ashcom Technologies MaintiMizer Suite computerized maintenance management system is an all-in-one solution designed to increase efficiency and profitability. Vaccine & Gene Therapy Institute of Florida (VGTI Florida) uses MaintiMizer to manage the 400 preventive maintenance tasks performed by a three-man team. With highly sensitive lab equipment requiring temperature control, delicate handling and precise maintenance, reliable CMMS software is vital to the company. Learn everything you need to know about Ashcom MaintiMizer. Our experts will reach out to you shortly.